Fairy gardens are hugely popular. 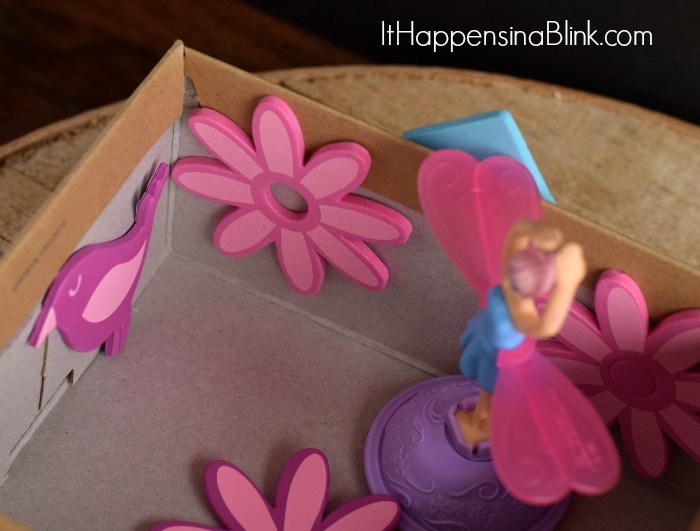 I reviewed a fun Fairy Garden Kit last year that my daughter still plays with today! Since Earth Day is this month, I thought I’d share an inexpensive Fairy Garden option made from a shoe box. A special thanks to CraftProjectIdeas.com for sending a few of the crafting supplies for this Shoe Box Fairy Garden project. This is a great kid’s craft for preschoolers and up! Our Shoe Box Fairy Garden is pretty basic, but I’m posting it mainly for inspiration. Add your own recycled creative elements to make it your own. 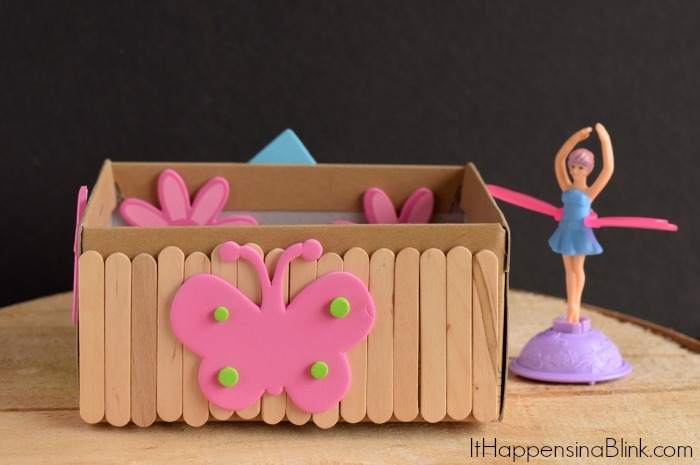 This project is as simple as having your child stick or glue the elements on the box. We used the Mini Craft Sticks to make a fence around the box. My daughter didn’t want to paint hers, but it would look pretty painted (and add another crafting element to the project!). Glue the craft sticks on the side of the show box and then paint them, if desired. 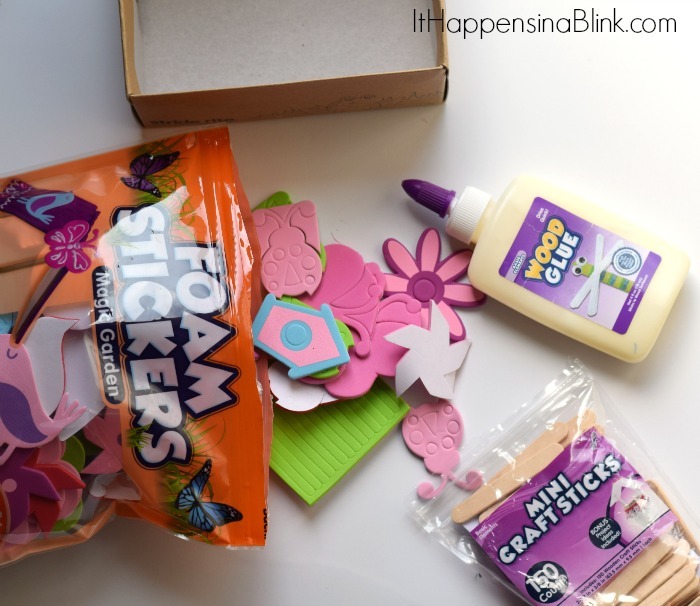 Use the Magic Garden Foam Stickers to embellish the rest of the show box. I’m thinking my daughter was having a lazy crafting day because she didn’t use many of the varieties in the sticker bag! There’s ladybugs, birds, butterflies, flowers, grass, and leaves galore included in the sticker bag! There are plenty of sticker options to add to the Shoe Box Fairy Garden to make it look whimsical.. The inside of our Fairy Garden is not filled. My daughter said she wanted to keep it like that because she stuck flowers to the floor of the box. But your child can get creative and maybe add a recycled element that is great for the indoors. Many Fairy Gardens call for sand or soil, which doesn’t make them optimal for indoor play. Shredded recycled paper would make it more inside friendly! How would your child create a Show Box Fairy Garden? This is so cute! My daughter would absolutely love it! Bonus: It’s a great way to recycle all my old shoe boxes. Thanks for sharing! This is such a great idea for Earth Day! I love how the box turned out. It is really cute. My nieces would really enjoy making one of these. I’ll have to try it out with them this weekend. Aw, things like this make me wish for a little girl 🙂 So cute! Love this idea!! So fun for Earth Day and you’re teaching them something too!! Fairy gardens are so adorably cute ! My kids are a little too old for them now, but I might still get a kit for myself ! Looks like great fun ! I remember doing crafts like this when I was younger – I totally need to do this with my daughter! 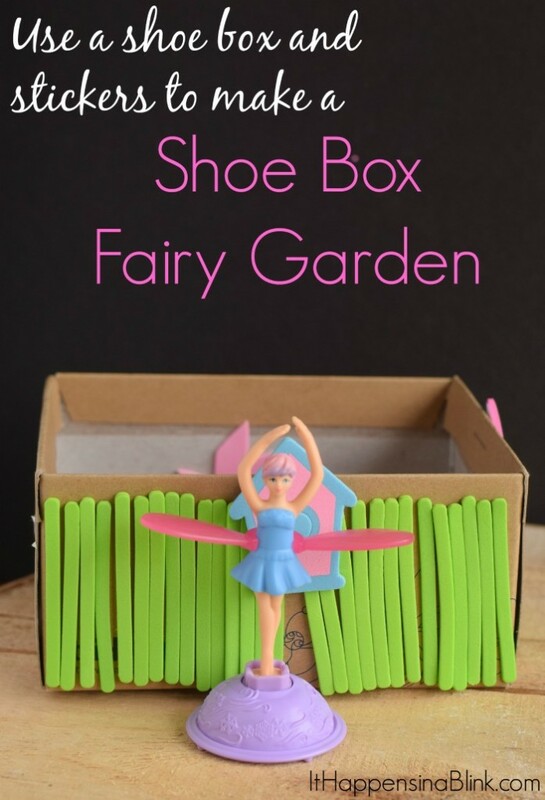 My toddler son would love setting up a fairy garden with a shoe box– what a fun kid craft! This is so fun! We have a fairy garden and love it! My daughter will love this. She is always using shoe boxes or any mailing boxes I get to make houses for her little creatures. I absolutely love this and reminds me of childhood fun! How fun, this will make a great activity for kids on vacation this week!